When people think of palliative care, they also tend to think of terminal illness. As you will see, this is actually one of the many myths that currently surrounds palliative care. Unfortunately, these devastating myths go on to prevent many people from benefiting from it. In fact, palliative care actually not only seeks to improve the quality of a person’s life at a variety of different stages of their life and/or illness, but also takes a holistic approach in doing so. This means that palliative care seeks to offer not only physical care such as pain management, but also psychological, social and spiritual care. Even those who are not necessarily at the end of their lives, such as those with illnesses that may shorten life, can benefit from this holistic approach. Similar to the above myth is the idea that palliative care gives patients the sense that their lives are going to end soon. 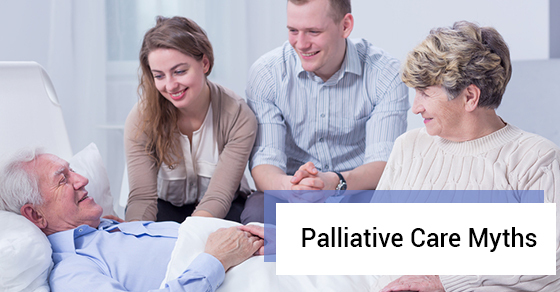 However, since palliative care is not only for those with terminal illnesses, it is actually in the patient’s best interest to discuss palliative care options as early as possible in order to improve their quality of life as much as possible. Whether it addresses the psychological ramifications of their illness or the physical ones, palliative care is beneficial for those in the early stages of their disease or illness. Ultimately, you want your loved ones to receive the kind of care that they want to receive in the event that they can no longer make these decisions for themselves. These discussions must be had early on. In fact, palliative care and treatment often go hand in hand. Many treatments go on to be very beneficial to patients, increasing their quality of life regardless of their particular prognosis. Palliative care does not mean that treatment stops when patients begin to receive this care. As mentioned above, one aspect of palliative care is physical and social care, which illustrates that treatment is actually at the centre of it. A similar myth is also the idea that pain medication given in palliative care can cause addiction. While it can cause the body to develop a tolerance, it does not cause addiction. Although there are those in the medical field that specialize in palliative care, the goal of this particular type of care is for it to be incorporated into how all health practitioners treat those who have advanced illnesses. Similarly, palliative care is offered not only in hospital settings but also a myriad of other settings, including at home. It is necessary that health practitioners work to dispel this myth so that patients can receive the benefits offered by palliative care. C-Care Health Services offers a variety of affordable, personalized and high-quality services. Contact us today for more.